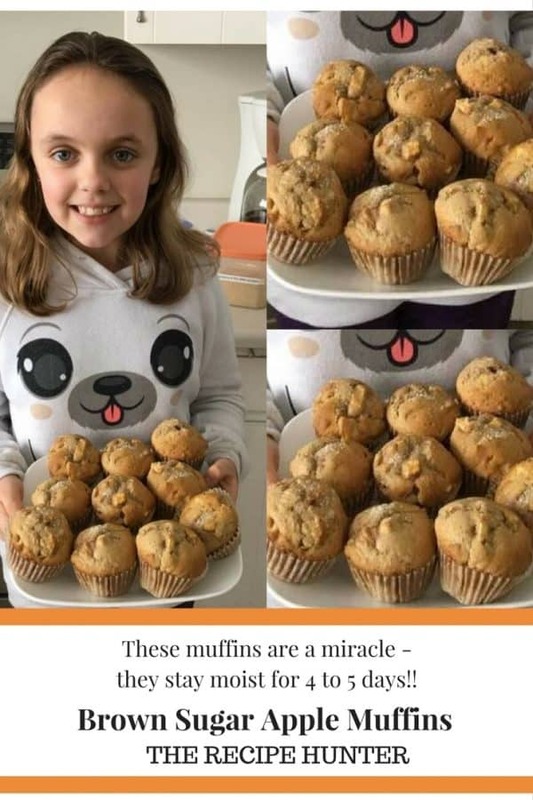 These muffins are a miracle – they stay moist for 4 to 5 days!! KEY TIP: Do not over mix batter (causes dry muffin), stir until flour is just incorporated, few lumps are fine. This recipe will work with cup measures regardless of which country you are in, with the exception of Japan – please use weights provided. Brush a 12-hole, standard muffin tin with melted butter, or line with paper cases. Place butter and brown sugar in a bowl, whisk to combine. Add milk, then egg and vinegar. Whisk to combine. Scatter flour across batter surface, followed by baking soda, cinnamon, and salt. Whisk 10 times until the flour is incorporated – some lumps are fine. Stir in apple – minimum stirs just to disperse. Scoop batter into muffin tin – I use an ice cream scoop – filling it all the way to the top. If using a scooper, leave it the slight ball shape – don’t smooth the top. You should get 12. Sprinkle with sugar (if using – makes surface slightly crispy), place muffins in the oven. Immediately turn down to 180C/350F. Bake for 20 minutes (standard) or 18 minutes (fan/convection), or until a skewer comes out clean. Rest in the muffin tin for 5 minutes then transfer to a rack to cool. Once fully cooled, store in an airtight container – it will stay moist for up to 5 days. These also freeze very well. I will have to check Marlene and get back to you to let you know which she used.